Another greatly confusing area of foam mattresses is working out what all the different figures, measurements and ‘tensions’ actually mean. It’s not as if you usually talk about KG per M3 density with any other product you buy so it can often be incredibly difficult. Let us help clear through the mystery and provide you with some clear definitions of what density, hardness and firmness actually mean. Then you can work out the figures for yourself! The density of a foam refers to the weight of the foam in kilograms per cubic metre. Foams that have a higher density have more foam per cubic meter than lower density foams. Simply put you get more foam for your money. The more foam the higher the resistance to loss of hardness and are more resilient to stress. The hardness of foam is a measurement that gives a perceived firmness rating for a customer, ie the harder the foam is the firmer it will feel. This is where density being the only measure of support is inaccurate. You need to also know the hardness. Hardness is measured in a set range of tolerance and is not a one size fits all figure. It is worked out by compressing a piece of foam to 40% of its original size. This measurement is then displayed in newtons (N) so a hardness rating of 70-100N means it takes between 70 and 100 newtons of pressure to compress it to 40%. The higher the figure the more force is needed and, therefore, the firmer the foam. Firmness – How do I apply the two? The only way to accurately work out the firmness and quality of foam is to know both the density and the hardness. The density shows the amount of foam and the hardness gives the firmness. You also need to know the desired feel or reaction of the foam, ie you could have a very hard foam that is very responsive and ‘springy’ like Laygel. So although it’s got a high hardness rating, the manufacturing method provides means the end result is a somewhat ‘bouncy’ foam. So you need to know the way the foam is intended to react, fast response, slow compression or supportive for example. If you don’t have these measurements and descriptions, you’re only really guessing. For example, you could have a 60kg foam with a hardness of 40-70N and a 40kg foam with a hardness of 70-100N, so the less dense foam would be firmer, but the 60kg softer foam would be more resilient as there is more foam within it. We only use high-quality foams and present all the data you need to make an informed choice. When trying to compare to other foams remember, without the density and hardness you’re at best guessing. 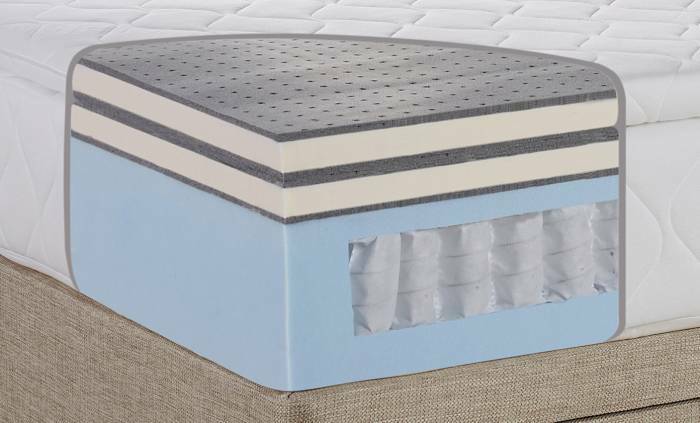 We would always ask you to challenge mattress retailers about the hardness of their foams. Need more guidance then give a team a call for friendly expert advice on mattresses on 0161 437 4419.